Wakeman Town Farm welcomes Chef Carlos Baez of El Segundo and The Spread on Thursday February 7. Join them for an intimate dining experience in Tim's Kitchen, featuring a four-course winter menu. $100 pp. Limited seating. First-come, first served. BYOB. Bobby Q’s & Co. has partnered with Letizia’s Pizza to create a Pulled Pork Pizza that will be sold throughout February at Letizia’s. All Proceeds raised from the purchase of this pie will be donated to “Filling in the Blanks,” an organization that provides meals to kids in need on weekends. Go forth and eat pulled pork pizza!! 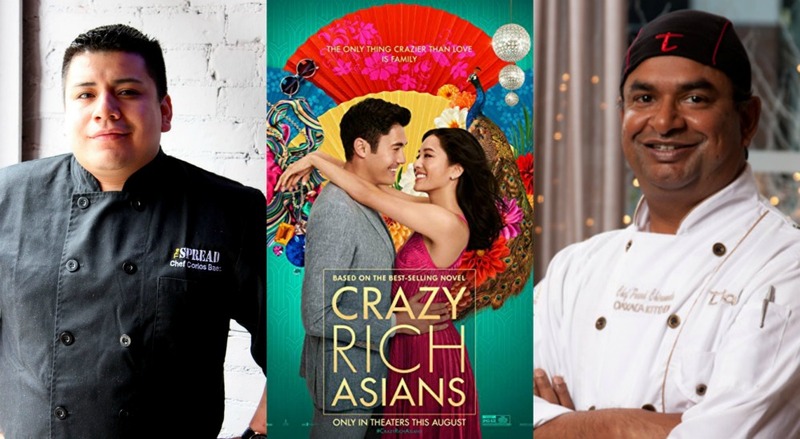 On Monday February 4, The Wadsworth Atheneum Museum in Hartford hosts “Food & Film: Crazy Rich Asians.” The evening begins with a screening of the hit moves at 4pm and continues with dinner catered by Mill Restaurant Group. Tickets start at $60. Chef Prasad of India Kitchen invites you to a cooking class on February 9 at 2pm. Start by discussing the regions of India and the menu for the day. Then, cook for about 2 hours before having an early dinner and open Q & A with Chef Prasad. $95 per person, plus tax and gratuity. Email chef@chefprasad.com to reserve. The Seaport Association hosts “Taste of the Seaport Restaurant Tour Card.” Enjoy deals at participating restaurants as well as buy-one-get-one entrees for just $50 per card. Proceeds benefit the Sheffield Island Lighthouse. Kids (10 and under) eat FREE with a purchase of an Adult entree ($15 or more) every Monday from 4pm-8pm at Finnegans Tavern, located at 292 Spielman Hwy in Burlington, CT. Toddlers can bake Valentine’s Day treats at Stew Leonard’s Newington on Tuesday February 5. They’ll prepare red velvet cake bites, strawberry frosted donuts, and chocolate covered strawberries! Ages 2-5. Visit The Schoolhouse Restaurant for a Piedmont wine tasting on Wednesday, February 6. Taste five elegant wines from the region- one white and four reds- from leading producers: Luigi Ferrando, Brovia, GD Vajra, Azelia, and De Forville. The wines will accompany a four course meal. Tickets are $95, plus tax and tip. AMG Catering is celebrating Valentine’s Day early with a VALENTINE’S COUPLES CLASS on Wednesday February 6. Create Goat Cheese Souffle for Two, Steak with Red Wine-Shallot Sauce and roasted red bliss potatoes, Hericots verts with Orange Gremolata, and Dark Chocolate Mousse with Fleur de Sel Whipped Cream with a loved one. $220 per couple, 7-9pm. Save the Date for "Maritime with a Twist," an ADULT ONLY party hosted by the Maritime Aquarium on Thursday, February 7 from 6-9pm! The evening will feature restaurants from South Norwalk alongside local brew pubs and distilleries. This celebration for adults 21+ also allows guests to enjoy the Aquarium's newest attractions including the incredible expanded jellyfish area! Live jazz will be provided by The Damon Grant Project. On Thursday February 7, Stonington Vineyards invites you to a French Macaron & Wine Pairing Event. It lasts from 6-8pm. On Thursday February 7, visit Hanging Hills Brewery in Hartford for “Knots and Hops.” Participate in a seminar on learning to tie important knots and hitches and their climbing applications. Some of the knots you will learn include the figure eight follow through and the double fisherman's and a variety hitches such as the clove hitch or prussic. Come with an appetite for learning new skills and enjoying great beer! Oyster Club in Mystic hosts a Wine Dinner with Maria Sinskey & James Wayman on Friday, February 8 from 7-9pm. East Coast meets West Coast at Stone Acres Farm this winter with a wine dinner featuring a five course menu paired with Sinskey Vineyard wines. The menu combines products and preparations from both coasts, featuring seafood from our local waters, greens from the farm, California citrus, dates, and lamb from Sinskey Vineyards. Sunset Meadow Vineyard in Goshen will celebrate Valentine’s Day early on February 8. Enjoy a quiet, intimate night with your special Valentine in their beautiful tasting room with live music. Dine on a four course dinner with appetizers, salad, dinner and dessert. It is $150 per couple and doors open at 6pm. On Saturday February 9, visit Bessemer Hall in Bridgeport for a Valentine’s festival to beneft nOURishment Bridgeport and Black Rock Farmers Market. There will be local vendors, food, music, and activities from 1-am-4pm. Admission is free. The Westport Weston Chamber of Commerce is pleased to announce the Supper & Soul, dinner and concert series continues on Saturday evening February 9. The single ticket multi-faceted event entitles participants to enjoy a 3 course meal at one of eight downtown restaurants, then see a concert at the Seabury Center and return to any of the same restaurants for happy hour pricing for drinks. The ticket for this event will be $75 per person. This concert will feature the husband and wife led band, David Wax Museum. In celebration of the government getting back to work, Bloodroot is selling a limited number of Bloodroot gift cards at a discount! Get a $50 gift card for just $42.50 or a $100 gift card for $85! These are only available while they last or until February 15th - whichever comes first. Millwrights in Simsbury has new seasonal desserts. One of the new offerings, the Earl Grey “Cloud,” consists of earl grey meringue atop a whipped maple-creme fraiche, lemon cream spread, thinly sliced Meyer lemons, and a sprinkling of homemade maple sugar candy.